Blog Is it worth getting an Overwatch boost? Is it worth getting an Overwatch boost? Since most of the player base is against the boosting trend, we decided to find out if there’s any other story behind it, given that a lot of people, even some top streamers, are juggling with the term “boosted” in Overwatch competitive games. That being said, a lot of other people are curious as to how this works, and naturally, if it’s worth getting an Overwatch boost. What does it mean to get an Overwatch boost? Essentially, Overwatch boosting is a service where a player decides to get help by purchasing services from a company that specializes in boosting. There are various websites that offer these services, starting from $4 for 50 Skill Rating in Bronze and rocketing up to hundreds of dollars per 50 Skill Rating in Top 500 range. They do not offer only skill rating boosting, they can help with your new season’s placement games, maintain your skill rating so you don’t decay or even get you to Top 500. The services are available on all platforms. You can opt-in to share your account with them, meaning that their professional player logs in to your account and completes the service you purchased. These companies swear that they take all precautions when it comes to securing your account against Overwatch bans, suspensions and disqualifications. However, you can choose not to share your account and get the boost by playing yourself, with a little help from a professional player. This option though is more expensive. This might sound unfair as to getting this kind of advantage with money, but is that completely true? You may have heard the mantra before, practice makes perfect, which is essentially true. However, if you’ve played the Overwatch competitive games long enough, you may have realized that in order to progress in ranks, you actually need to be significantly better than the players in your rank range. Meaning, if you’re currently competing in Overwatch 2700 (Platinum) skill rating range, you’d need to be at least “a diamond player” in order to beat platinum players efficiently; ideally a “master player”. This happens because, for instance, if we assume the matchmaking system will fairly match you in a span of 1000 games and all players are 2700 (+-50 skill rating) skilled. This of course, isn’t true, as the matchmaking system is far from this kind of accuracy, but let’s assume that it is, for the sake of it. That would mean there’s a 50% chance that any of the teams win. And we know that you need at least 51% winrate in order to progress, albeit slowly, but still progress. Therefore, in order to increase your winrate to at least 60%, one team needs to be better. You’re not in business of relying on your teammates in order to win, and your goal is to make sure you’re the one securing the win. Therefore it’s easy to conclude that you need to be much better than those 2700 skill rating players in order to win at least 60% of the games. This is not fair or ideal because, you’re competing in 2700 and you’re trying to reach 2750, 2800 and so on, why would you need to be 3000, or 3500 skill rating skilled in order to progress in 2700? This is where an Overwatch boost could come in handy. If you ever played World of Warcraft or any other MMORPG, you probably know that when beating lower level minions, you will gain less experience and vice versa. While this is just any MMO’s leveling system, the same principles apply to Overwatch competitive play. Better and higher ranked players will challenge you more and force you to adapt faster. Ideally you’d want to play in a higher bracket, but not high enough for you to be just a walking duck for more skilled players. One tier above yours is what you should aim for, and then when you think you’re good enough, you can aim for one tier higher until you find yourself in a spot where you’re losing games constantly. Another thing is that time can be tricky, and some players do not have the time anymore or just want to reap the cosmetic rewards. We all face day to day chores, jobs, school, university, friends and so on. Like we explained above, unless you’re much better than the other players in your skill rating range, the grind will be long and painful, and many players just can’t spare the time anymore. Despite that, we all still like the cosmetic rewards that we would get anyway if we’d have the time to grind for hours daily. 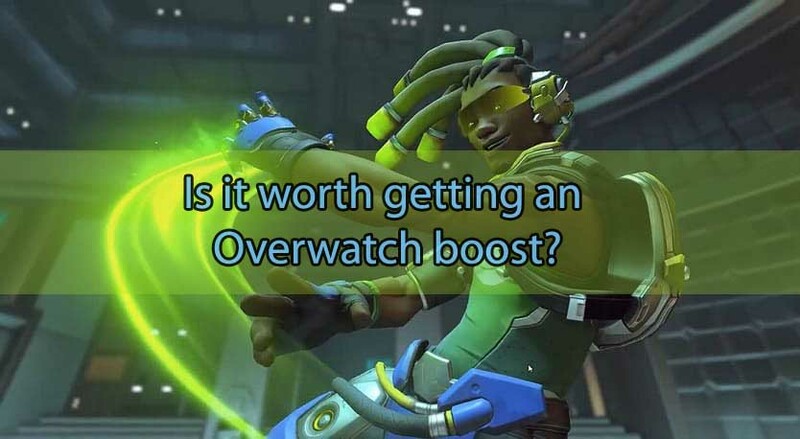 More so, there are many players who will purchase a high skill rating boost and just have the boosters maintain it for them in order to get their hands on the competitive points and sprays. Grandmaster – 1750 Competitive Points. Having that said, I hope we’ve shown you that there’s two sides to every story and we’ll let you come to the conclusion yourself. In case you decide to go for an Overwatch boost, we researched the best places to get one and ranked them by quality. What’s the best place to get your Overwatch boost? After quite a bit of research on finding a cheap yet very good Overwatch boosting company, and after spending a considerable amount of time researching prices and reviews, watching videos, and having Live Chat conversations, the company that met all of our needs is Boosting Factory! Their Customer Support was super helpful, and was spot on with answering my questions, which means it wasn’t just a random Live Chat guy. More so, they’ve got a ton of 5 star independent reviews, and they’ve been around since Season 1, which also puts them on top when it comes to experience, as well as being the best Overwatch boosting site at the end of our research.